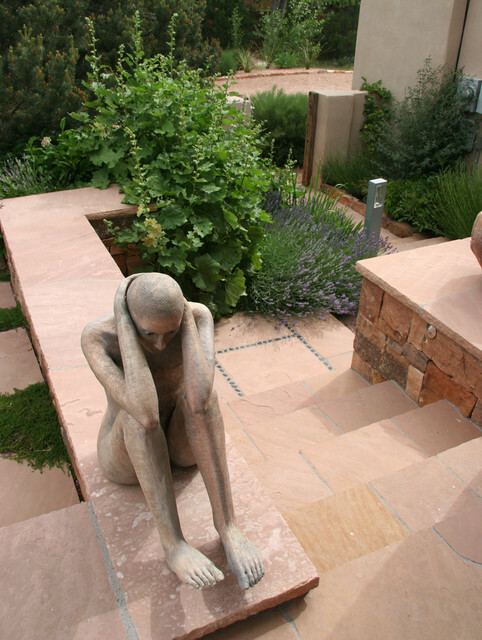 Contemporary Sculpture Garden - Traditional - Landscape - Albuquerque - by Clemens & Associates Inc. Which company is the wall cap from? Thanks! thanks for asking! it is sandstone flagstone from Arizona cut to the length and width necessary. Many stone yards can bring this material in. Rethinking sculptural accents is an excellent way to create a memorable garden experience. Good garden art is a worthwhile investment. Let me just say that the resin tabby cat or gnome found at the local thrift store will not create the memory that you want your guests to take away from your garden.Art can generate emotions and create continuity in your garden. The piece shown in this photo generates feelings of solitude, strength and even self-esteem. The sculpture is a close match in color and texture to the stone wall, creating a homogenous vibe.